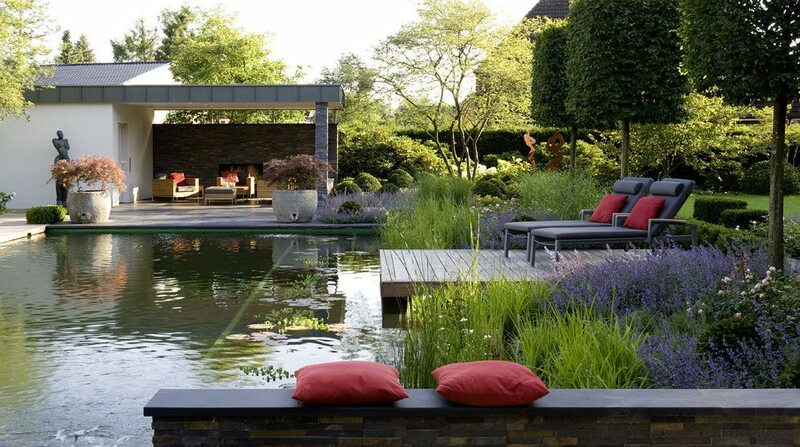 Home Design Is a natural swimming pond the solution to swimming pool headaches? If you’ve got a pool, you know the routine. Everyone’s happy to use it but you’re the bunny that has to maintain it! 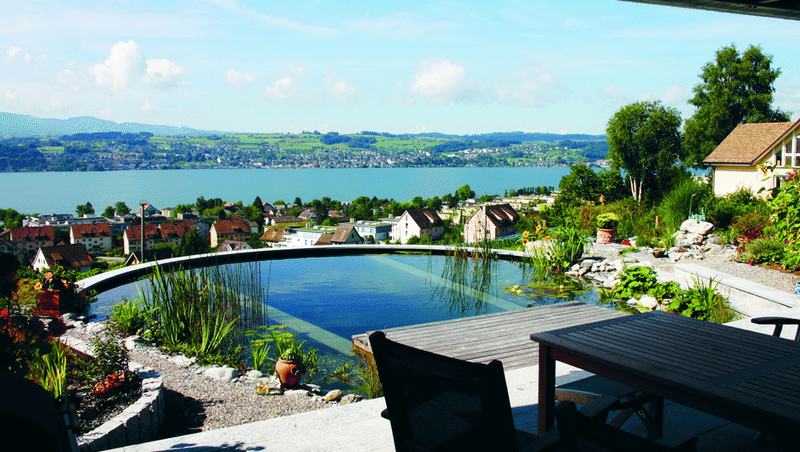 Water feature or swimming pool – you decide! Designed and built by Biotop Natural Pools. Doesn’t it make you wonder that while many homeowners consider it a necessity, others see it as a daily burden and a disaster waiting and begging to happen? It’s a fact that a pool turns many would be home buyers off! We know you have your opinions. Hold them for a while. We’re about to introduce you to the ultimate swimming pond. But before we do that, let’s consider the pros and cons of pool ownership. There’s no denying that a well maintained and landscaped pools look stylish. It’s an eye-catching feature which sets your property apart. It’s always great to get away to the beach. But by the time you fight the traffic and find a park, a lot of the fun has disappeared before you even see the water. A pool offers instant access to a great family-time activity. Just a few steps and you’re there – stress free, dent free, and road-rage free! And you probably just saved yourself anything between $10 and $25 of motoring costs. It’s the best place in the house you can use to entertain your guests – day or night. Send the invites, prepare some finger food, pour the drinks, add music and you have your own version of paradise right in your backyard. It’s a tragic reality that we see children drowning every year in domestic pools. Good pool fencing helps, but children have a wonderful knack of climbing and finding gates that are not fully locked! Don’t fall victim to negligence – constant vigilance is the only option. Then there are the less obvious dangers. Chlorine helps keep your pool free from algae, waterborne insects and other unwanted little nasties. Unfortunately, it also damages hair and skin and can irritate your eyes. Recent studies also link chlorine to respiratory ailments including asthma! If you’re a keen gardener on a typical suburban block, you have to sacrifice a very big chunk of your hobby area. Cleaning the pool doesn’t offer a gardener quite the same meditative qualities. Forget the brochure – pools can be plain hard work! A swimming pool is visually attractive only if it’s well maintained. Leave it unattended for a while and you can quickly convert it to a swamp. I’ve done it and I can tell you that it took many hours of hard yakka before it was a safe place to swim again! If only the costs stopped with the final payment to the pool builder! Instead, many pool owners – especially in warmer climates – see their electricity costs rise by up to 40%. Then there are the chemicals, and, if you can’t do it yourself, the weekly pool guy visit. And, if you are in a cooler climate, will you heat the pool to extend the swimming season? Oh… did we mention that many pool pumps will need replacing within five years? As a rule of thumb, you should budget 12.5% of your capital costs as your annual running expense. So if your pool has a current replacement cost of $25,000, allow $3,250 per year to maintain it. Ouch! It sounds a lot but remember that whether your pool is salt or chlorinated, it’s a very harsh environment. Things wear out quickly. More often than not we make the decision to add a pool based on the realistic expectation that our children will get great value from our investment. And they do… until they reach the age where beach with mates is a lot more exciting than pool with parents ? Imagine a pool with minimal maintenance yet maximum visual appeal. A pool that is functional 365 days of the year. A pool that looks better as the years roll by. A pool with all of the positives and few, if any, of the negatives. This idea transforms to reality when you build or convert your existing pool to a natural swimming pond. A natural swimming pond is the best of a water feature and a pool. Now throw in the best that nature can provide to make it chemical free and you have a swimming pond. What makes it different from a conventional swimming pool is the regeneration zone – a designated area for aquatic plants and rocks that act as natural filters to keep the water crystal clear and clean. This area adds beauty while doing all the hard work! It looks natural because it is natural. And like most things natural, it has the capacity and ability to pretty much look after itself! You can easily integrate your garden and convert it to an unique oasis right in your backyard. It takes relaxation to a new level. A natural pool takes you closer to nature. It creates a peaceful atmosphere that disconnects you from the outside world. Aside from just plain old swimming you also get to enjoy the unique scenery that only natural swimming ponds can create. Entertain your guests in a special way. Hosting a party at your own natural swimming pond is like taking your guests out of town to a place where they can enjoy chemical-free water, natural breeze, and good scenery. Not to mention the food, drinks, and the company of family and friends. A swimming pool ends up unwanted because nobody uses it anymore. However that doesn’t excuse you from spending time, effort, and money maintaining it. We can bring these unwanted pools back to life by converting them to natural swimming ponds. The only thing it requires is a regeneration zone which we’ll be discussing shortly. Safety issues of swimming pools are manageable. It’s the maintenance that makes swimming pools a burden. This is where natural ponds excel. They are close to maintenance free! Nature does the hard work for you. You don’t need chemicals or a sophisticated filtrating system. Effortless and chemical-free maintenance is done by pumping the water to a series of biological filters consisting of rocks and aquatic plants. The plants deprive algae of nutrients preventing its growth. Friendly bacteria attach to the rocks and further filter the water of its impurities. And lastly – but optionally, a waterfall adds stunning visual appeal while super-oxygenating the water. When size doesn’t matter – a small but beautiful natural swimming pond! Do you have a pool? Do you see it as an asset or a liability? What are your thoughts about natural ponds? Previous articleWelcome to the world of natural swimming ponds!